The other day while on Outnumbered as “One Lucky Guy,” Bill O’Reilly made a comment about Maxine Waters’ hair. He said that it reminded him of James Brown, “the Godfather of Soul”. Most people took the comment for what it was, a joke. Moreover, most people agreed, because in fact Maxine Waters rocks one of the many hairstyles of James Brown. We posted on this story, as I found it humorous as well. Nevertheless, I said publicly on various radio shows, as well as my own that O’Reilly will ultimately issue an apology for the comment. You simply can’t be a white man who works at FOX News and make such a comment. Those comments are reserved for Joe Biden, and other racist white Democrats. 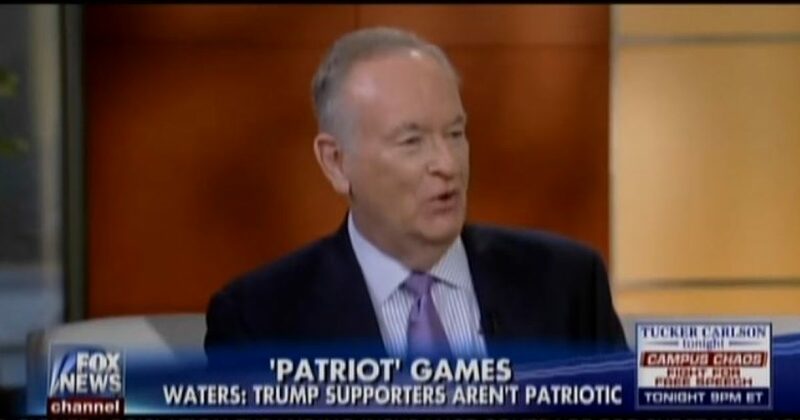 As predicted, O’Reilly has apologized. In a statement, O’Reilly said that his jest about her hair was dumb. O’Reilly’s apology won’t do any good. When the Left smells blood in the water, they attack. Remember Paula Deen? She may have used the n-word decades ago, and she was reduced to an apology. The outcome? The Left continued its relentless persecution of Deen. Here’s what TMZ said of the apology at the time. Paula Deen continues to step in it, and we know part of the problem is that her team doesn’t have a clue. She just issued a weird, video apology with an edit after almost every sentence. It’s as if some publicist is feeding her lines that she has trouble delivering. Rather than explaining why she used the N-word in the past — something she might have been able to explain given her background — she’s just begging for forgiveness. It feels like it’s coming from a bunch of suits, and not from her heart. Huge miss. Sources connected with Deen tell TMZ … this was an apology produced by committee — a committee of lawyers, publicists and other managers who don’t understand the meaning of the word “apology.” They’ve strung a bunch of words together that make Deen look pathetic … throwing herself at the mercy of the court of public opinion. And what of Donald Sterling? He was forced to sell his basketball team. Then there was Don Imus.